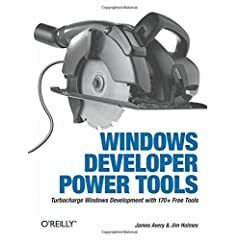 Windows Developer Power Tools* is a huge book. It is so big that I can't hold it in one hand. It is so big that I need to put it someplace to read it. It is so big that I think that it should come with a warning label about possible serious injury if you are reading while tired. It is also a hot recommendation from me if you are a developer on Windows. I believe that I am fairly proficent in the tools department, author of some (Rhino Mocks is in the book! :-D ) and have used many. Nevertheless, this book had me muttering "Oh, I gotta try that" in the first chapter. I am writing this post now on page 503, because I just had to stop when I realized how beautifuly NCoverExplorer can integrate into my builds. To say that it is packed is a major understatement, but I consider this a great thing indeed. I probably could go and find all the information online, but having it all concentrated in one place is a huge deal, especially since each tool come with an explanation and usage that is often better than what you can find on the site. (Probably because the medium is not one where you can say "download this exe and start playing). This book is going to serve dual purposes. First, it allows me to learn very quickly about a lot of tools that I can use. Second, this is something that I can give another developer, and tell them to look for the tools that we are using, thus helping them get up to speed with them. This is something that you really should at least leaf through, and check what is avialable for your usage. The worst thing about this book is that I have to actively fight the urge to start using all those tools in my current projects. That would be an interesting manuevour, to say the least :-). Q: Doesn't VSTF does it for us? And here is some Google Love for the Windows Developer Power Tools site. * Amusingly, Amazon list 140 tools, while the cover lists 170. I may have done some of the work for you already (NCoverExplorer). It is in the form of a CI Factory Package but I am sure that you could quickly plug it into your build anyway. The disconnect on the Amazon cover is due to James's and my complete lack of control and discipline when writing the book. It started out as an 800 page work with about 120 tools, grew to 140 when they did that first cover, then ended up with 175. OK, so we went a bit nuts, but we had a great time writing it! I'm happy to see you're pleased with the book!